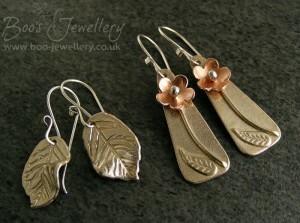 I’ve posted several times previously on my exploits with the creation of metal clay jewellery. Metal clay is, as the name suggests, a clay-like medium composed of metal particles, an organic binder and water that can be worked and formed as a wet clay, further honed in a dry state (such as components assembled for composite pieces, like many of mine) and then is fired in a kiln at very high temperature to magically become a solid metal creation. There are now a significant number more clays than even when I started, from base metal clays like copper, bronze, iron, steel and brass to various precious variants of silver and now gold. 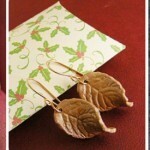 Antiqued copper contoured leaf earrings on feature earwires. 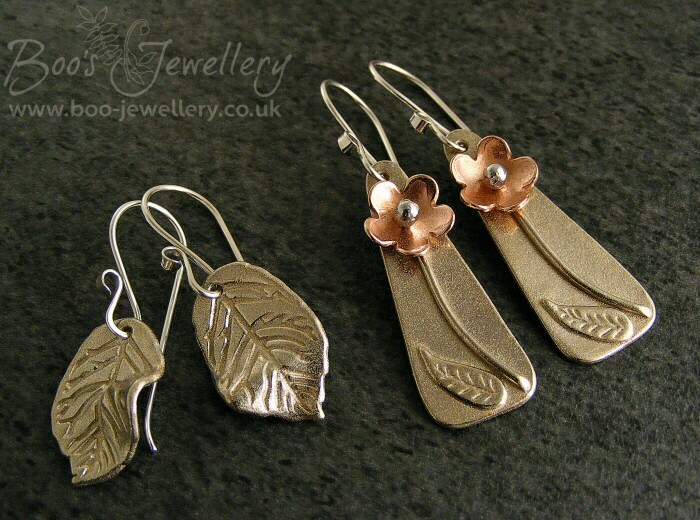 Not only are there many different metals (and many tones or colours of bronze and coppers etc) but there are many more brands on the market too – with new ones appearing regularly. If you’re feeling truly adventurous, there are even recipes to make up your own. Each clay has its own properties and some are best suited to particular types of work. I’ve routinely used several brands for different styles of work. You need to work a little with the clay to find out its particular personality and to decide how it best fits into your designs – knowing which one is best for each piece. It’s also true to say that I’ve tried several that I couldn’t get on with, that either didn’t suit my work or were inconsistent for getting reliable results with, so were abandoned. 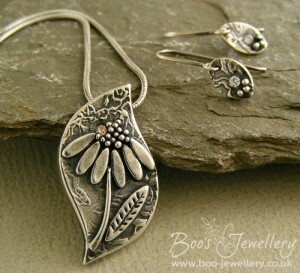 Fine silver daisy pendant with an inset cubic zirconium gemstone and matching earrings. 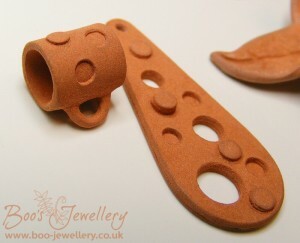 I recently noticed that one of my suppliers was stocking a new-to-the-UK clay range from Australia; Aussie Metal Clay. There offer a significant range of clays, but the ones being stocked here in the UK at present are a range of bronzes in their medium fire range. The features of the clay looked very interesting and the examples of finished pieces I’d seen made with it were impressive. So after a little research, I decided to try a couple of colours. They make a standard clay and a super flex variant of each colour. 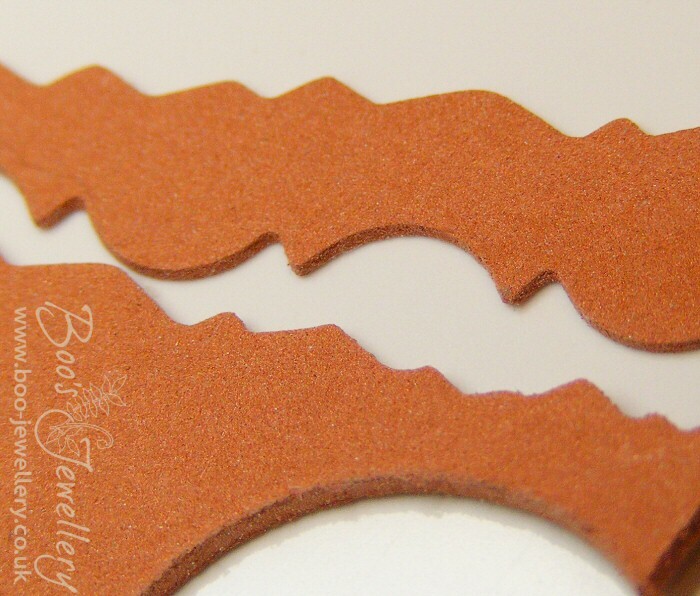 As I was hoping to cut some pieces with the Silhouette cutter (that has featured in previous articles as a tool in my jewellery making and design work), their recommendation was to use the super flex, which is what I’ve been working with. As this clay range is new to the UK and people like myself are only just getting to know it, there is less information available than for other longer-established brands, so whilst I don’t normally talk specifics about materials and suppliers, I hope that posting some more details of this particular clay might help other artisans like myself whilst researching and considering it. The dry AMC super flex clay can be cut with scissors, scalpel and cutting machines. 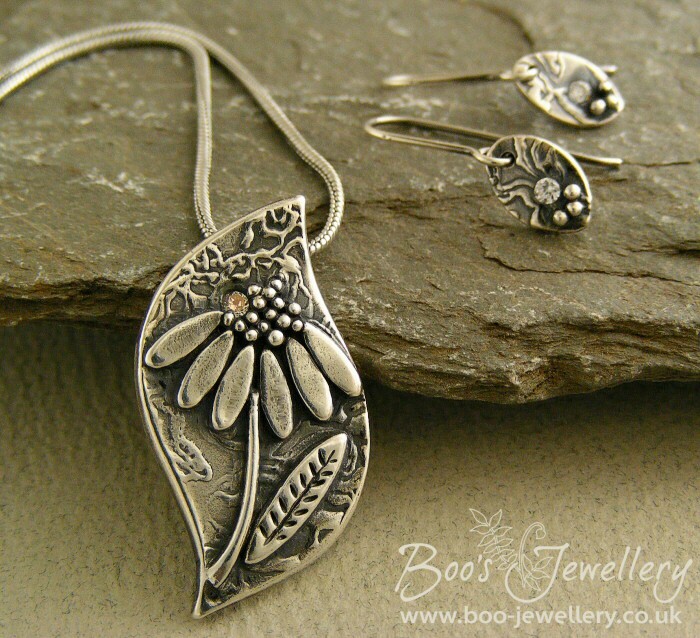 I’ve very much enjoyed working with the clay, it has properties and features that suit my work really well and as I’ve had excellent support from the proprietor Roslyn Bailey and metal clay artist who works alongside her in developing the clay range, Kim Morris, I’m happy to endorse the product and put some information out there to help others. 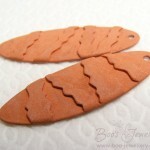 The two clays I’ve worked with feel the same in use, so I won’t bother distinguishing them. The clay is supplied as a dry powder that you mix yourself to a clay with water – this means that if you buy a 100g packet, once mixed, you get something like 130g of usable clay, justifying the slightly higher initial price than pre-mixed clay of the same initial weight. The dry super flex clay was cut on the Silhouette for these two pieces and the tube bail was rolled (very gently) from dry, cut clay. The super flex variant also comes with a little sachet of a gel-type substance that you mix into the dry powder before the water. 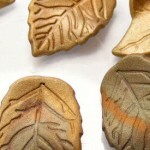 It mixes together very easily and you quickly have a workable clay. My own practice is to mix the clay, then knead it with a palette knife on a glazed tile to mix it thoroughly and then let it rest for a little while and fully absorb the moisture before using. 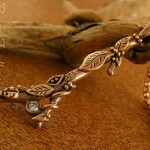 It rolls out nicely and takes texture very well, it doesn’t stick to your fingers or tools. 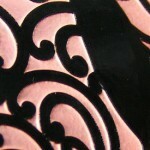 It has a lovely smooth silky texture which feels very fine and is a pleasure to work with. It retains its workable moisture level better than any other base metal clay than I can think I’ve used before and I don’t often need to add any more water to it. 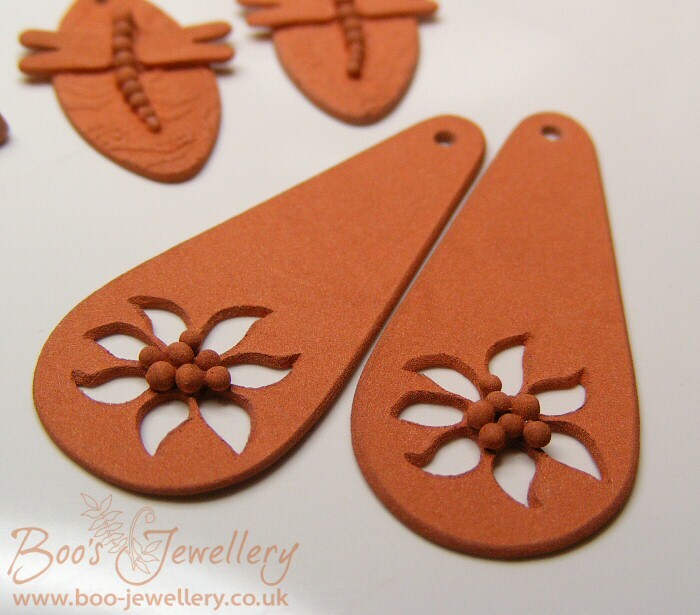 These Poinsettia style earrings were designed and cut with the Silhouette cutter from dry clay 2 cards thick, then tiny rolled balls separately appliqued. The dragonflies in the background had wings cut with a craft cutter. Occasionally if you’ve been fiddling a lot and maybe re-worked it several times, it starts to feel dry, but I just pop it into my storage box (I keep it in a little dish inside a larger airtight container that has a moistened pad inside, away from the clay) and paint a little smear of water over it and leave it to sink in, then re-knead it before use. I can roll tiny smooth round balls with it and it makes a nice rolled snake too – which in the super flex variant, I haven’t needed to moisten before I curl and shape, other than for the tightest of coils. I’ve been able to roll thin sheets with it that can then be cut with either the Silhouette cutter, scissors, scalpel and I’ve even used craft punches and decorative scissors. 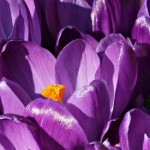 It can even be rolled (if eased very gradually and with care) in its dry form. Kim Morris gave me a super tip that really works; if the clay has been in its dry form for a while, the flex properties diminish a little, but putting it in the fridge overnight restores its flex. I also found that it reconstitutes really well. My own method is to pile up any scrap and failed elements and loosely break or chop them into smaller pieces and spray them with water, leaving it covered, to soak in for a while. I then roughly mix it and cover with thick plastic film and roll it out and gather it up again repeatedly, at which time it probably still has dry lumps in, which will show as paler patches. These get gradually smashed up as you roll, probably requiring the addition of more water – a little at a time. A couple of rolling sessions later you will have a workable clay. If it was really dry clay, I tend to leave it overnight to fully absorb the moisture into the organic binders and then re-knead with a palette knife before use. Many re-constituting techniques talk of grinding the clay back to powder in a coffee grinder or the like, then sieving it to get out impurities, but I’ve never had a problem with any clay using my technique; it saves on wastage, doesn’t fill the air with dust and as I don’t use much oil or lubricants with it, feel that the clay remains pretty pure – although I don’t use sanding dust as I think this will have particles from the sanding medium, but I do use anything I’ve carved or trimmed and drilling swarf. 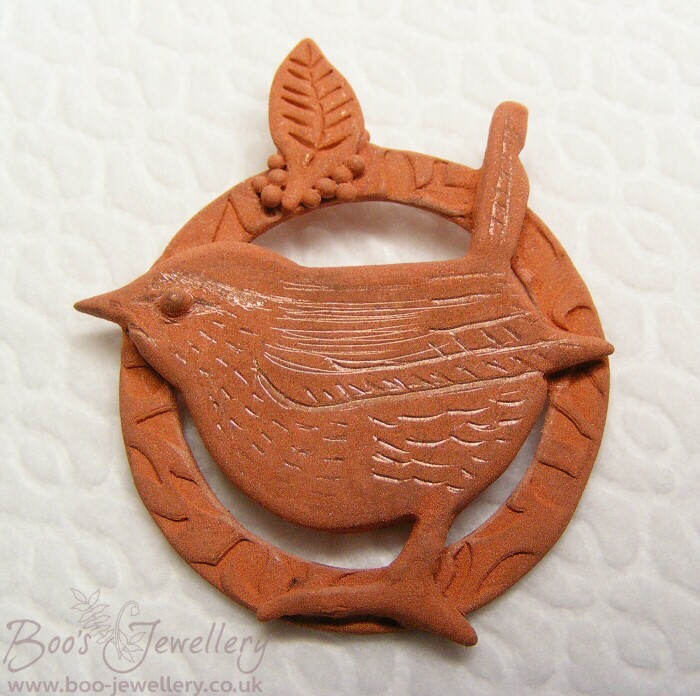 I have workable new clay with minimal fuss. 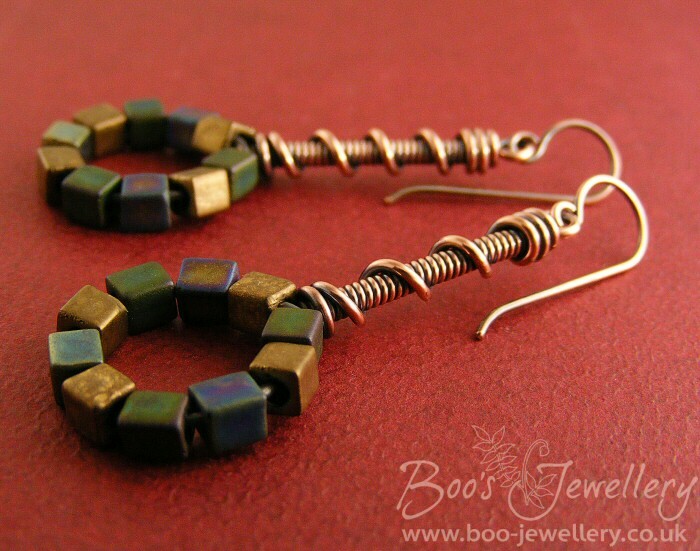 Whilst I had good success straight away with several Aussie Metal Clay pieces, some have been less than spectacular. 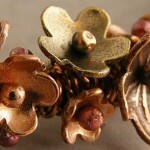 I had several assorted issues and it was obvious that some pieces simply weren’t sintering fully. Base metal clays are fired in 2 stages; firstly to burn off the organic binder particles (the water should already be fully evaporated, clay should be fired totally dry) and secondly to fuse the remaining metal particles together as a metal piece. Sintering is the process whereby the loose metal particles just start to melt on their surface, allowing adjacent particles to bond together, forming a cohesive metal structure, but short of actually melting. This is why metal clay shrinks during firing, firstly you remove the binder and then fuse the metal particles into a closer solid texture. The inadequate sintering I experienced manifested itself variously as warping and slumping in thinner pieces, resulting in distortion and some cracking. 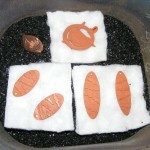 The thicker pieces simply crumbled on the surface when I started cleaning them up after firing. Any remaining binder will prevent the metal particles from fusing to each other and if burn off is irregular across the piece, warping and cracking will occur. Some of the thinner pieces (mainly a Silhouette-cut bezel – partly the fault of the design too) simply snapped off – no doubt still too brittle where not sintered fully. I contacted AMC and Roslyn Bailey was very patient with me, working through a series of potential solutions and it became evident that it was the burn-out stage of the firing that was the culprit and she made some suggestions to try. If the organic binder isn’t fully removed, it will remain in the final piece, preventing the metal particles from bonding to each other properly, so this stage is vital to get right. I was able to put into action her suggestions – and thankfully, it worked beautifully, addressing the issues I had. Everything came out fully sintered and with negligible distortion – and that was more down to the design of that piece than the firing schedule. 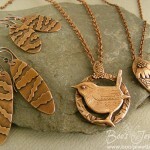 I made several test pieces of different thicknesses and also repaired one of the earlier pieces and re-fired that. It was Ros’s suggestion to fire the pieces on kiln pillow (on top of the carbon) to improve airflow around the piece during burn-out and after discussion we also decided to try reducing the temperature of stage one but increase the hold time. The kiln plug was removed to vent the kiln during the stage one burn-out. In this initial test firing, I used brand new activated coconut carbon to eliminate any potential issues with pre-used carbon, in a stainless steel firing pan (I gave up on flake free foil containers some time ago, I’ve had more consistent results with all clays since) in a Paragon SC2 kiln. The clay was AMC medium fire super flex in Desert Sun. Stage one was ramped at Spd3 (1000°F / 555°C per hour) to 400°C and held for 50 minutes. 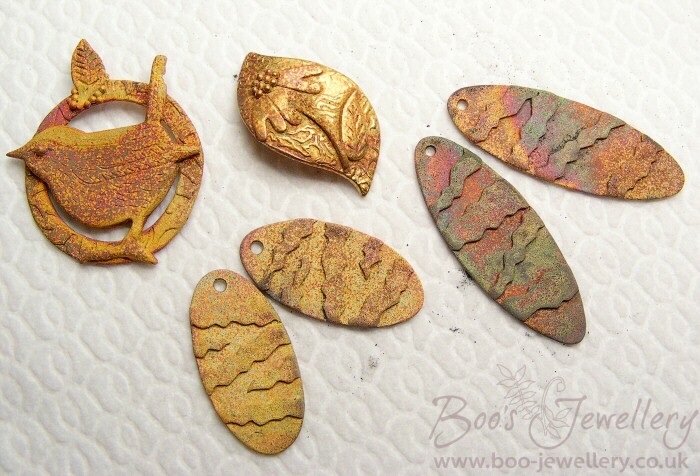 When the kiln had cooled enough to be safe to work with, I covered the pieces with kiln paper where there was texture and the wren pendant with holes in (see photos in the Gallery below) I tented with a folded piece of no-flake foil, something I’ve been doing successfully for some time. I then covered everything in more carbon and the pan lid and replaced the kiln plug. 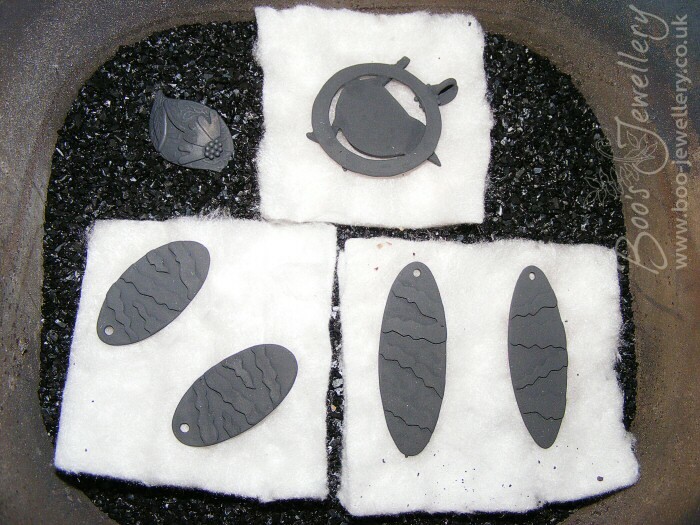 After success with the kiln blanket below pieces, I’ll possibly use this in future above pieces too, in place of the paper or tent, as their only purpose is to keep carbon out of texture or holes that can cause cracks if it wedges in crevices as the piece shrinks during firing. Stage 2 was ramped at Spd4 (1500°F / 833°C per hour) to 780°C and held for 3 hours. The kiln was left to cool to about 200°C and then the pieces removed. 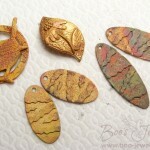 I’ve not been quenching the AMC pieces, I let them cool on a ceramic tile. The appearance of the pieces immediately out of the kiln and then after polishing and antiquing can be seen in the Gallery below. This is a perfect example of a failure being a positive and valuable learning exercise – often it’s the failures that we learn the most from. Without a negative initial outcome, I wouldn’t have sought out assistance, thereby learning an improved technique, which in turn will result in better work overall long-term. Aussie Metal Clay medium fire superflex clay in Antarctic Moonlight. 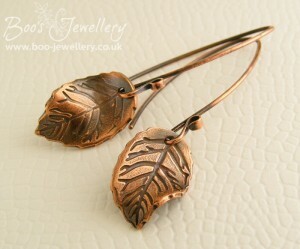 The earrings have been paired with polished Sterling silver earwires and rivets and the flowers are copper. I’ve since done a similar firing with one of the other medium fire clays from Aussie Metal Clay; Antarctic Moonlight, which is reputed to need a slightly lower firing temperature due to the higher tin content with it being classed as a more silver coloured bronze. I did the same basic firing as for the Desert Sun, as outlined above, but lowered the temperature in stage 2 by 20°C to 760°C, still holding for 3 hours and this sintered perfectly. It is also worth noting that as Antarctic Moonlight is a white bronze, with a higher tin content, it’s significantly more brittle and pieces need to be a bit thicker to be robust enough for wear. The AMC recommended minimum thickness for Antarctic Moonlight is 5 cards thick (approx 1.25mm). I cut some small test pieces using the Silhouette that ended up just under 0.7mm thick, totally forgetting about the thickness recommendation and whilst they fired nicely, I was able to just snap them in my fingers, even though they were solid metal right through the breaks that polished to a shine later. 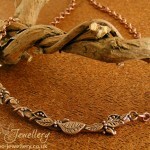 The thicker pieces in the batch came out really nicely and feel very robust indeed. So bear this in mind, the Antarctic Moonlight won’t be suitable for bezels or prongs that might need moving later to set stones etc. and I doubt it would manipulate successfully if you wanted to straighten any warping or movement during firing. 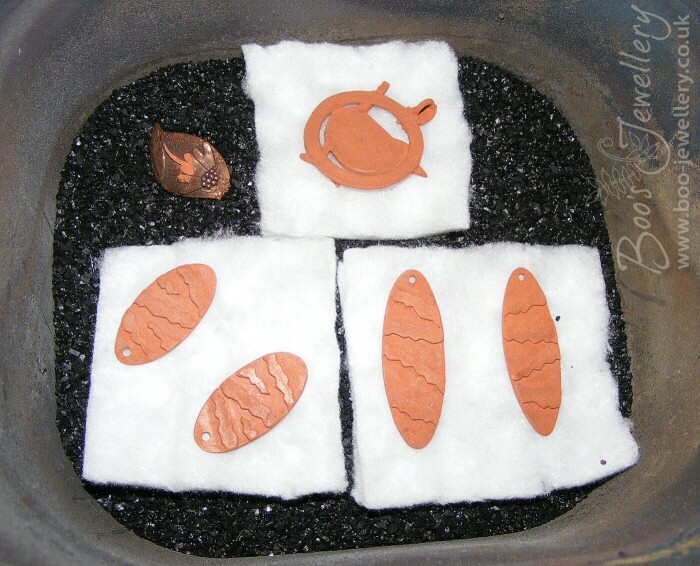 Photographs to illustrate the kiln schedule and technique described above, using Aussie Metal Clay’s medium fire super flex clay. 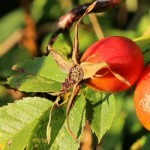 There are more details in the captions of the photographs. 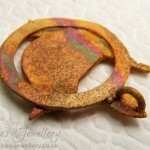 A bezel pendant that didn’t fire well. The thick back didn’t sinter in the centre causing it to bow – and that area subsequently crumbled off. 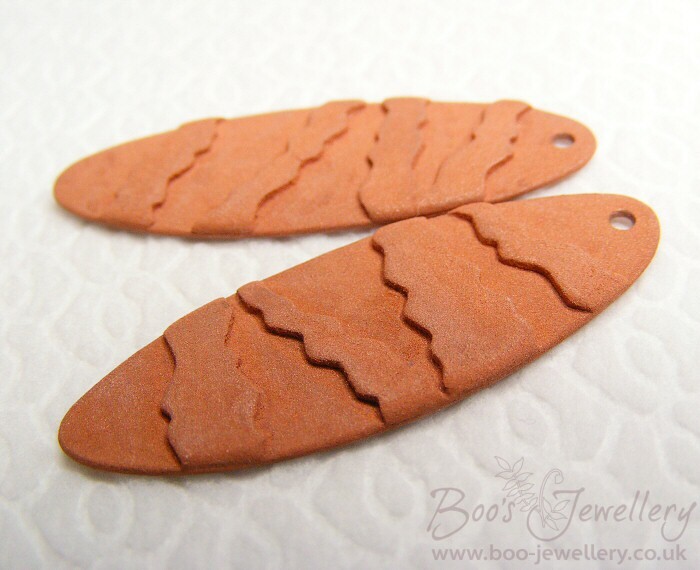 A pair of earring components in Aussie Metal Clay medium fire super flex Desert Sun. The ovals were 2 cards thick and the applique was from the same sheet, cut with decorative scissors. Wren pendant in AMC medium fire super flex Desert Sun. There were several elements that I use often, like the balls and a D loop bail on the back of the leaf, so it would test those components at that firing schedule. AMC medium fire super flex Desert Sun components ready for stage 1 burn-out firing. 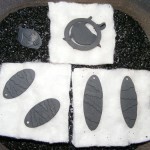 I placed the raw pieces on kiln pillow – a thinnish section split off a much thicker piece. The pendant at the top left wasn’t on the kiln pillow as this was a second firing and I was only firing the repair. After stage 1 firing, pieces are blackened, but still nice and flat. On previous firings, similar pieces were already distorted at this stage, hence leading us to conclude it was the burn-out stage that needed attention first. 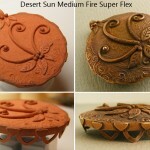 AMC medium fire super flex Desert Sun pieces immediately out of the kiln. Still nice and flat. 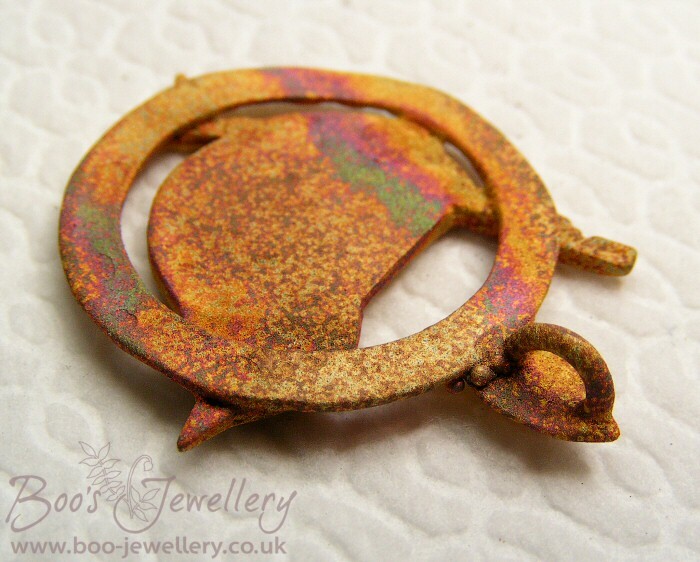 The wren pendant (back) straight out of the kiln. It’s difficult to believe that this funny looking rough appearance will soon become shiny metal with the application of some elbow grease. Finished pieces after polishing and antiquing – AMC medium fire super flex Desert Sun. 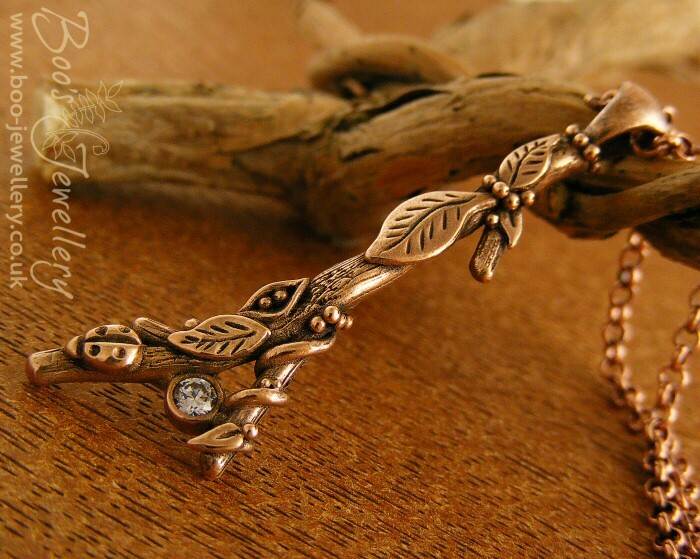 I’ve finished several new pieces recently, including a couple of new twig necklaces (well, a necklace and a pendant) featuring tiny hand sculpted naturalistic details. 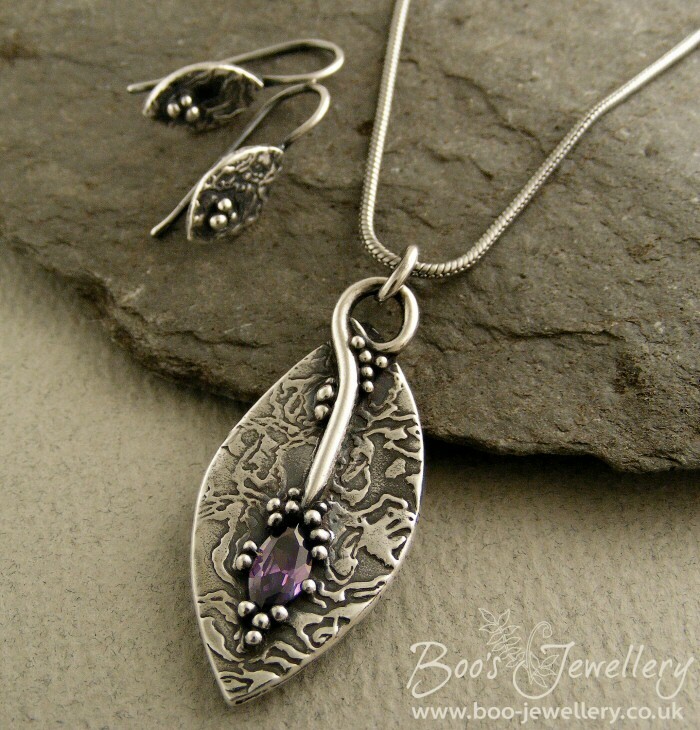 Pure silver pendant, set with an amethyst coloured marquise shaped cubic zirconia gemstone. 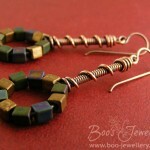 Coil on coil antiqued copper earrings with a loop strung with metallic coated seed bead cubes. 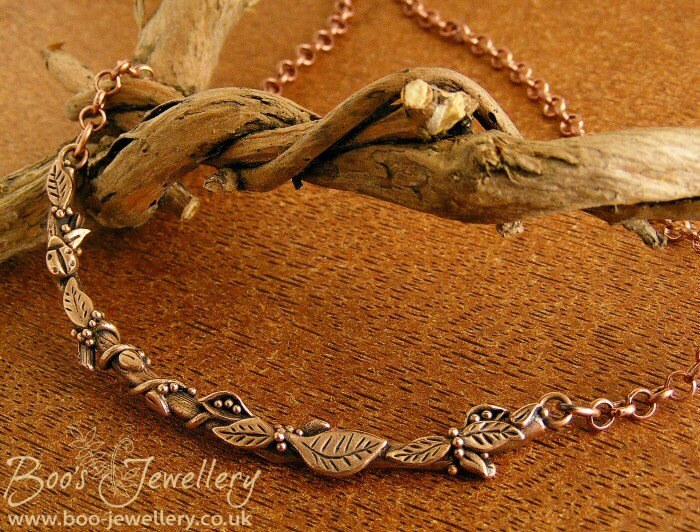 Twig necklace with tiny hand sculpted details, including leaves, tiny berries, seed pods, tendrils and even a tiny ladybird scampering along the twig. Made in Aussie Metal Clay medium fire superflex clay Desert Sun. 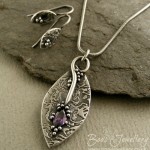 Twig pendant with hand sculpted details and set with a pale lavender cubic zirconium gemstone. 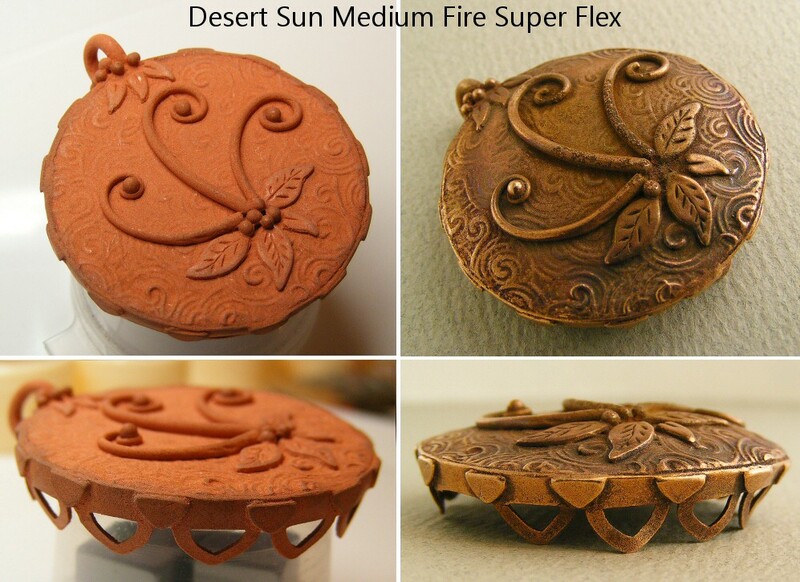 Made in Aussie Metal Clay medium fire super flex clay Desert Sun. 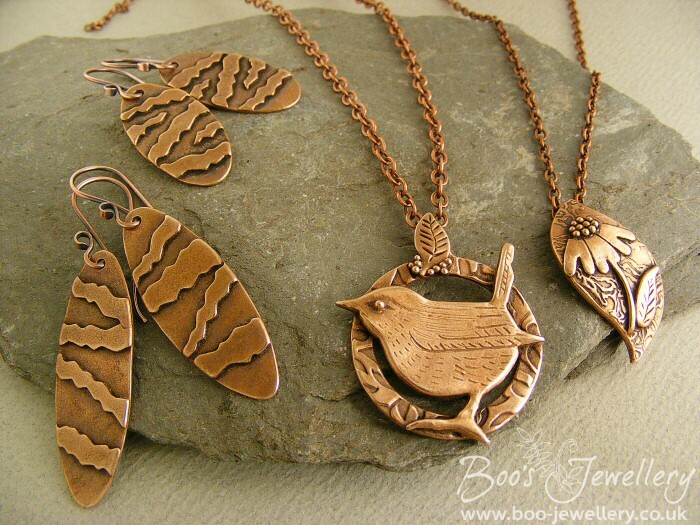 This entry was posted in copper jewellery, finished jewellery pieces, jewellery and tagged Aussie metal clay, base metal clay, copper clay, Desert Sun, firing Aussie metal clay, firing metal clay, kiln firing, kiln tests, super flex metal clay, test firing. Bookmark the permalink.